Spain is full of beautiful, breathtaking places. So many, in fact, that it may actually be difficult to decide where to go! Now you don’t have to. Instead, just follow this list of the 11 most stunning spots in Spain you shouldn’t miss. While the entire city of Barcelona is gorgeous in itself, the unfinished masterpiece by Antoni Gaudí, the Sagrada Família church, is simply mindblowing. Together with several other Gaudí buildings in Barcelona, the church has UNESCO World Heritage status. Construction of the famous building dates back to 1882, and although Gaudí died in 1926, construction still continues today. Projections say the Sagrada Família should be complete in 2026, and will include 18 spires. Once the building is complete, it will most likely be the tallest church in the world. 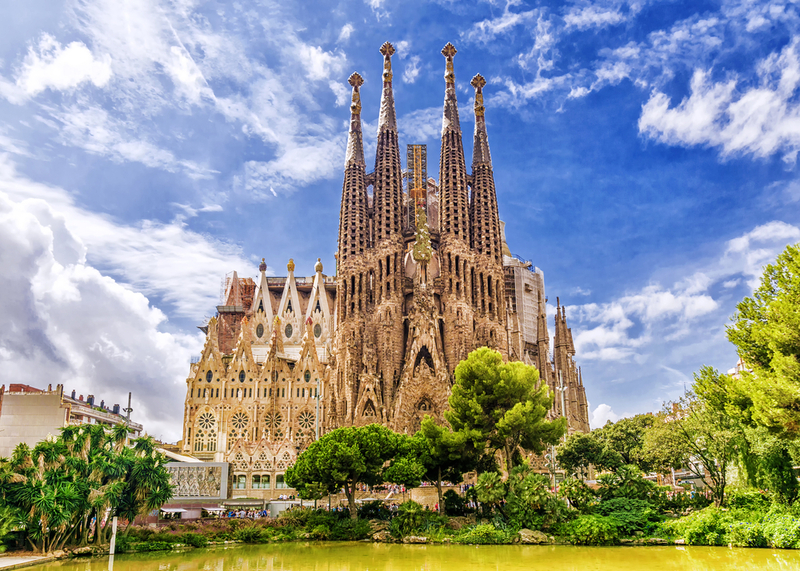 Despite its status as a construction site, visitors can still enjoy the inside and outside of the church, as well as go up in one of the skinny spires for epic views of Barcelona. Insider tip: Buy tickets online ahead of time to avoid waiting in very long lines. After all, this is the most popular tourist attraction in Barcelona, with about three million visitors a year. 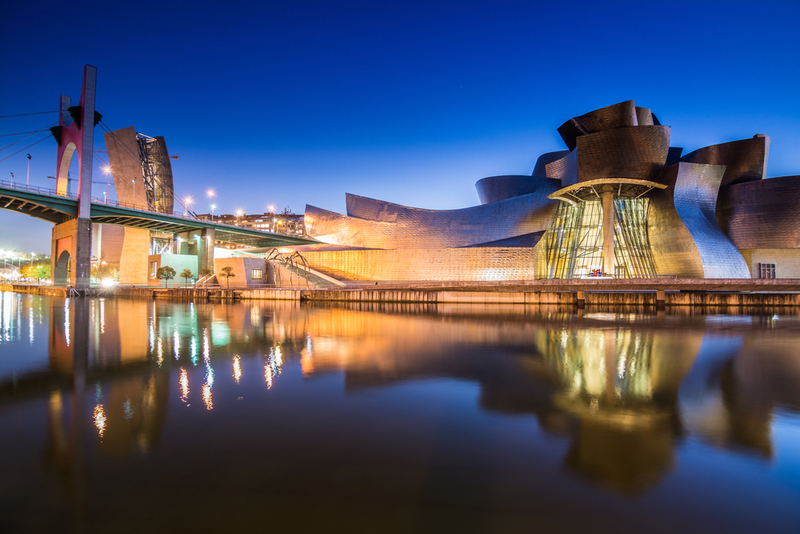 Designed by world famous architect Frank Gehry, the Guggenheim Museum in Bilbao has one of the most unique designs in the world. The exterior, which is covered with giant sheets of glass and titanium, is waved and curved to catch the sunlight. This modern art museum was built in 1997, and its permanent collection includes work by Rothko, Richard Serra, Basquiat, Anselm Kiefer, Louise Bourgeois and Jeff Koons. Located on the banks of the Nervión river, capturing the museum’s spectacular architectural design from different angles is almost as much fun as seeing the art inside of it. Insider tip: After a day filled with art at the museum, make sure to chow down on some pinchos, which are gourmet tapas Bilbao is famous for. 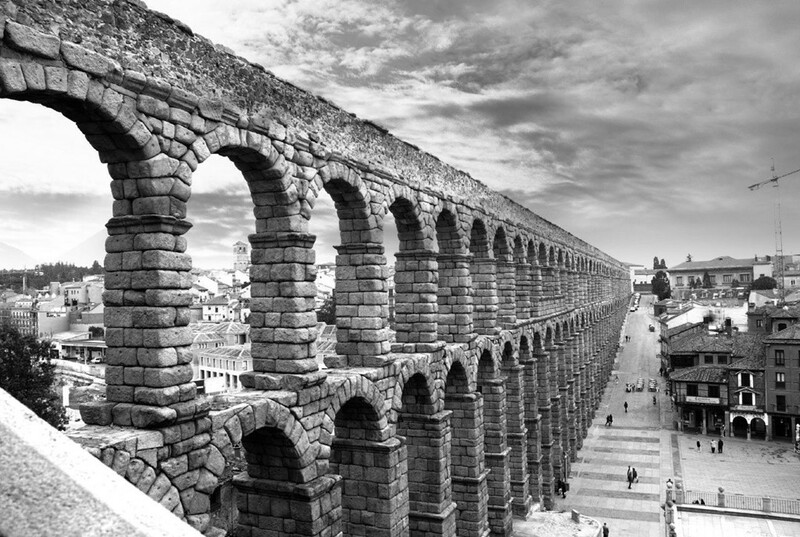 One of the most well-preserved in the world, Segovia’s enormous Roman aqueduct dates back to the first century. The massive stone structure spans about nine miles before it reaches the city center. The city portion has 167 arches, some double and some single. The aqueduct, combined with the cathedral and fairytale-like castle make Segovia ideal for a day trip from Madrid. Insider tip: After you’ve seen the all the tourist attractions, stop at almost any restaurant in town for Segovia’s culinary speciality of roast suckling pig, known in Spanish as cochinillo. The Alhambra is one of the most unique palaces in the world. Constructed in 889 by the Moors and later changed and renovated by the Christian kings in the 16th century, the palace is a grand example of many different styles of architecture and art. 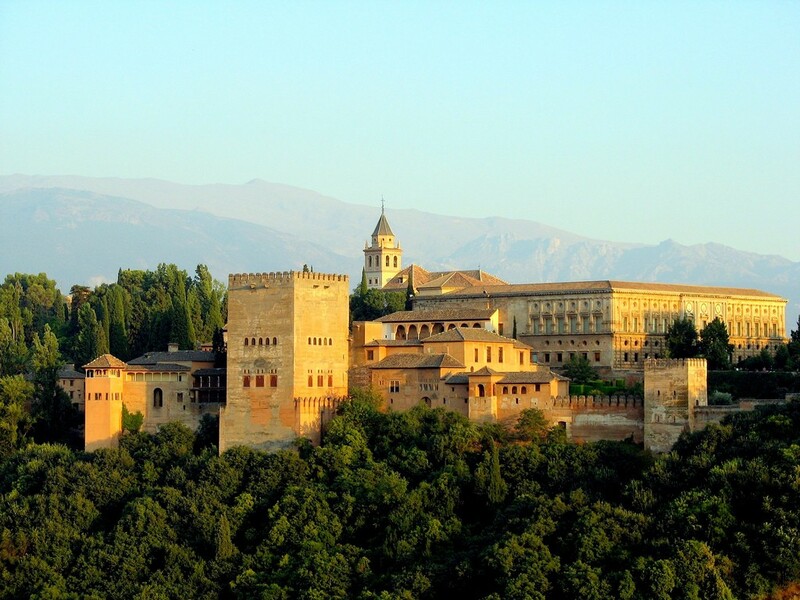 Declared a UNESCO World Heritage Site, this castle, which sits perched upon a hill, is not only exciting to explore, but also features stunning views of the city of Granada and the countryside and mountains that lay beyond. The picturesque gardens are a must-see, complete with blooming flowers and Mudéjar–style fountains at every turn. Insider tip: Buy tickets online well in advance to ensure you get to visit the Alhambra, as only a certain number of visitors are allowed per day. 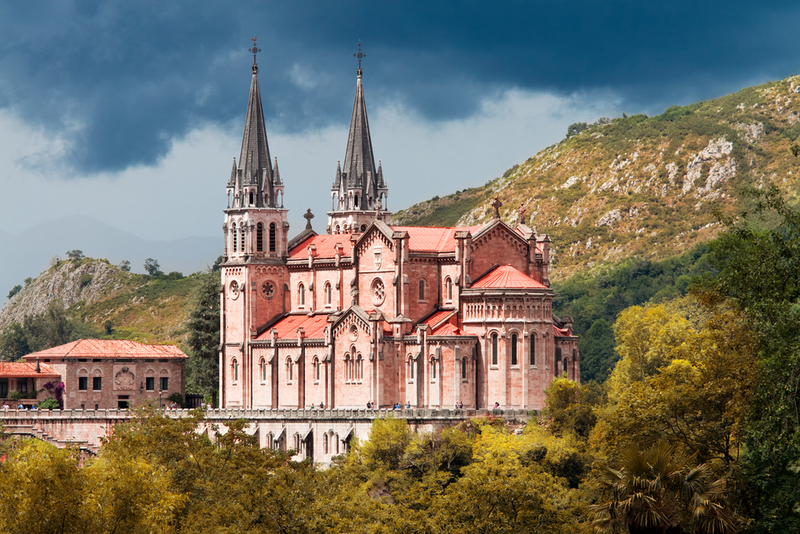 Towering above the Picos de Europa mountain range, the Basílica de Santa María la Real de Covadonga rises out of the greenery with its pink and red steeples. The Neo-Romanesque church is constructed entirely from pink limestone, and if you’ve never seen a pink church before this will more than satisfy your curiosity. The church is really just the beginning of all the beautiful things you can see in this National Park. The Santa Cueva de Covadonga is a sanctuary carved into the side of a cave and mountain with a waterfall, where the Virgin Mary has been said to appear to worshipers. Two spectacular glacial lakes, Lake Enol and Lake Ercina, are located in the park and definitely warrant a visit too. Insider tip: Be careful when visiting the park during inclement weather, as the lakes may be closed due to difficult curves and poor visibility. 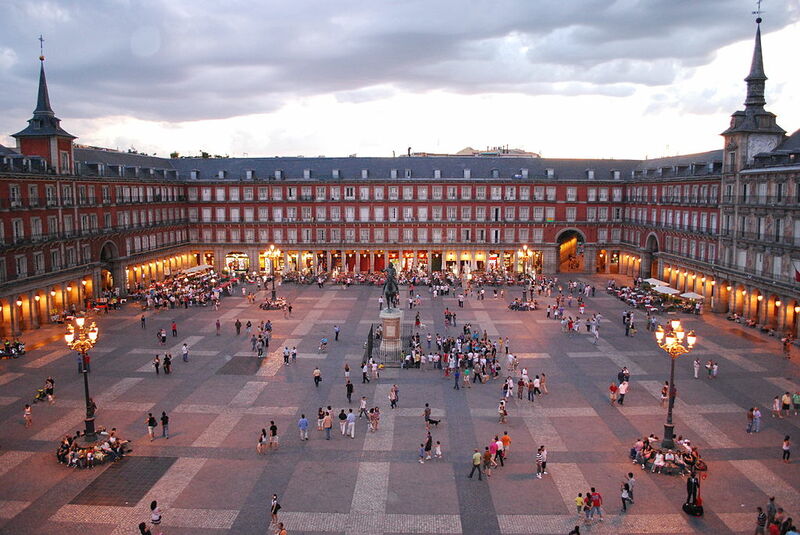 Walking into the Plaza Mayor is one of those magnificent moments that will have you staring in awe at the 237 balconies facing the square’s center, complete with a statue of Felipe III on his horse. Enjoy a delicious—albeit, overpriced, but who cares because the plaza is just so gorgeous—cold beer on one of the many terraces as you admire this 17th century plaza that was once the site of bullfights, public executions, trials during the Spanish Inquisition and crowning ceremonies. Insider tip: Check out the traditional San Miguel Market located just outside the Plaza Mayor for some tapas and vino. The gardens are the secret gem of this remarkable Moorish palace, which is a UNESCO World Heritage Site. A gorgeous example of mudéjar architecture, this palace seems as if it would be similar to the Alhambra, but in fact, it is wildly different. Set right in the city center, a visit to Seville just wouldn’t be complete without a visit to the Alcázar. The gardens are massive and complete with grand arches, fountains, palm trees, flowers and much more. You may stumble across some peacocks too. If this palace looks vaguely familiar, it’s probably because you’ve seen it on season five of Game of Thrones, which filmed at this location, among many others in Seville. Insider tip: Make sure to check out the water organ in the gardens, which chimes on the hour. It’s one of the few working water organs left in the world. Thanks to Córdoba’s hot, dry climate, the city’s very first inhabitants (first Romans, then Moors) created homes around a central courtyard, often with a fountain in the middle or a well. 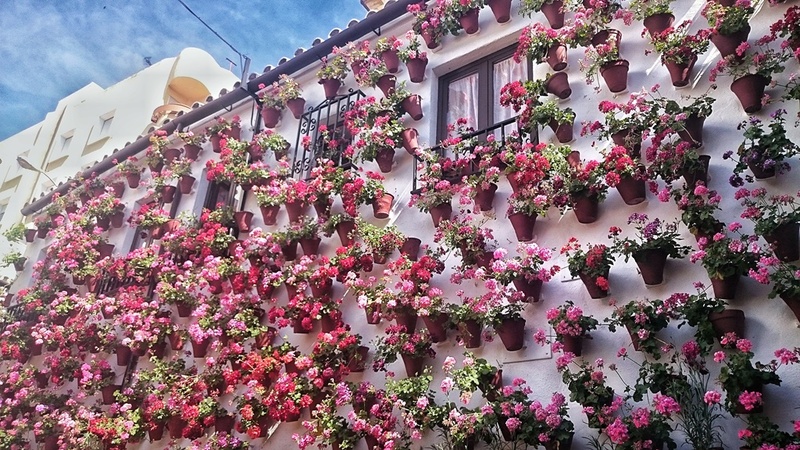 Still common today, this style of home is typical in Córdoba, and these small courtyards—now called patios—are world-famous for their stunning decoration and blooming flowers. Whereas you can view many patios year-round, the best time to see them is during the yearly patio festival each May. Insider tip: Checking out the patios in the early evening is a great way to avoid crowds, especially during the festival, when many go in the morning or afternoon. Ronda is one of Spain’s oldest towns, dating back to the 9th century BC. Not only is this mountaintop village quaint and picturesque, the gorge that splits Ronda is simply magnificent. Each angle of the gorge looks different—perfect for budding photographers hoping to get that amazing shot. 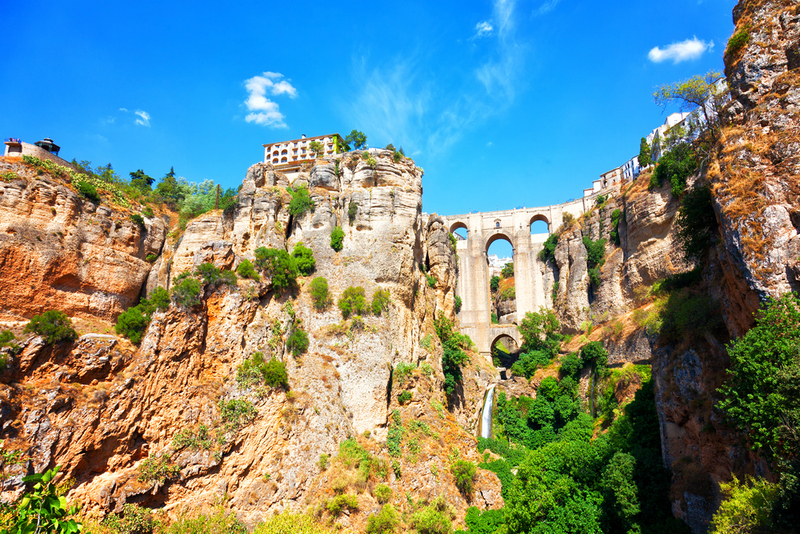 You can even cross the gorge by walking over the Puente Nuevo bridge. Insider tip: Once you’ve snapped the gorge from every direction possible, head into town to eat some rabo del toro (oxtail), Ronda’s speciality. Rising between 500 and 800 meters (1,640 and 2,625 feet) above sea level, Los Gigantes are enormous cliffs that tower above the ocean. Situated on Tenerife, one of Spain’s seven Canary Islands, the cliffs are truly a natural beauty. Enjoy the gorgeous panoramic scenery by climbing up to the viewpoint, strolling the beach down below, or even do some hikes if you dare. A visit to the nearby black sand beaches (made from volcanic ash) can complete your day of fun on the island. 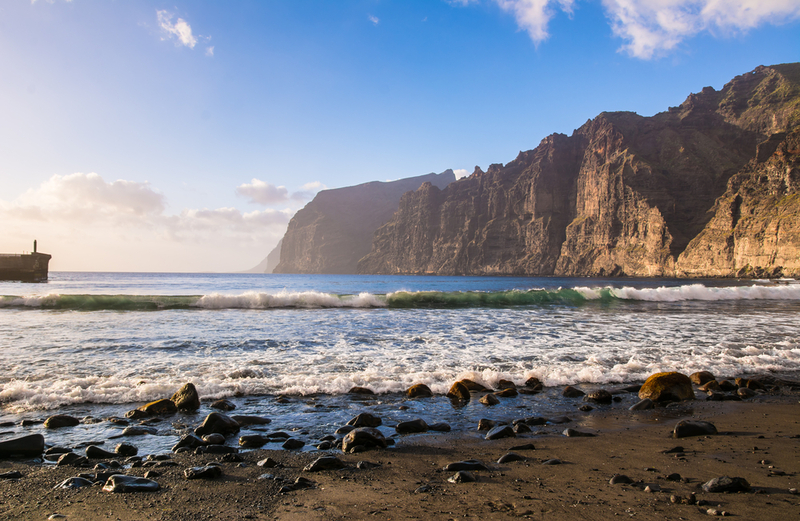 Insider tip: Visiting Los Gigantes (and Tenerife in general) is the ideal trip if you’d like to explore Spain but don’t speak any Spanish. The high expat population guarantees you’ll always be able to find someone who speaks English. 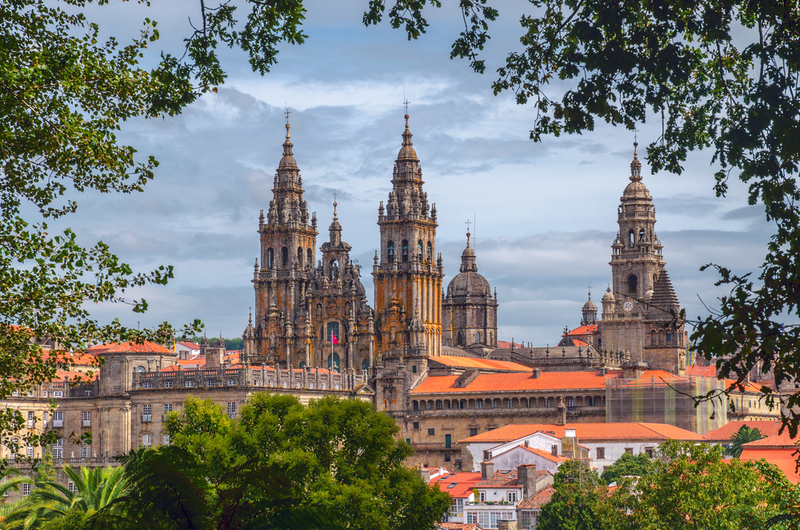 Spain is full of incredible cathedrals, but the Cathedral in Santiago de Compostela has a very special component. Not only is the Cathedral the burial spot of St. James, one of the 12 apostles, but it’s also the ending point of the Camino de Santiago (the Way of St. James), a pilgrimage of about 800 kilometers (500 miles) that many take through northern Spain. Completed in 1211, this Baroque and Romanesque church features 80-meter (260-foot) high bell towers that rise above the city. Insider tip: Pay the extra few euros to take the rooftop tour. It’s worth it to see the grand views of Santiago de Compostela.